Carnival Freedom, the newest Conquest Class cruise ship in Carnival Cruise Lines' vast fleet, can be found cruising year-round from Fort Lauderdale, Florida to the exotic islands of the Caribbean. Carnival Freedom will soon undergo 2.0 Fun Ship refurbishments. These additions will include the first-ever Dr. Seuss Bookville family reading venue, Guy's Burger Join, Playlist Productions, and the new Camp Ocean children's program. Post-refurbishment, Carnival Freedom will be transfered to sail from Galveston, Texas year-round doing 7-Night Caribbean cruises. 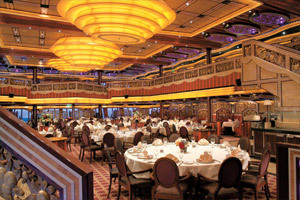 There are many dining options available on a Carnival Freedom cruise. 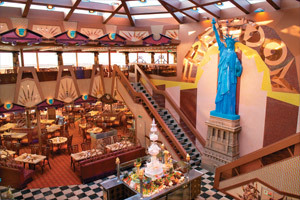 For instance, there are main dining rooms (where you can choose either Assigned or Your Time, an open format, Dining), a fantastic specialty restaurant (The Sun King Steakhouse), the Freedom Restaurant (located on the Lido deck, with made-to-order options and a buffet), as well as 24-hour room service. As far as things to do go, Carnival Freedom offers its guests a wide range of activities and entertainment venues. 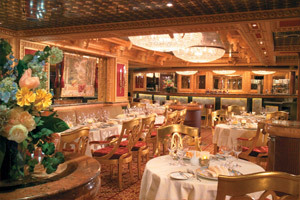 Victorianna Lounge is the ship's main show lounge, where a variety of live entertainment takes place during each night of the cruise. 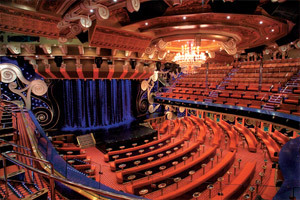 Among the possibilities are comedians, magicians, musicians, singers, dancers, acrobats, game shows (usually involving participation of a few of the ship's guests), and Broadway-style production shows. Also on board this ship is a full-service spa, fitness center, casino, waterslide, swimming pools, hot tubs, internet cafe, duty-free shopping boutiques and many bars and lounges (including Dance the Night Away, a 70's dance club). 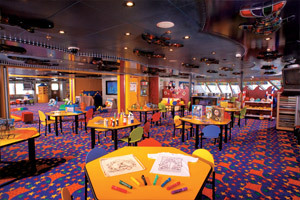 Families traveling with children and teens should be happy to hear that Carnival has a fantastic youth program available on board Carnival Freedom, Club O2 is a teen hangout that features music, video games and food. Camp Carnival is for children, ages 2 through 11, and offers supervised activities for your kids to enjoy during your cruise. 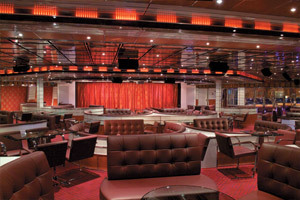 Located outdoors aboard Carnival Freedom is a 12' x 22' LED screen with a powerful 70,000-watt sound system. 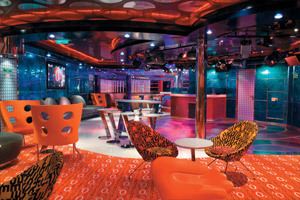 While at this area of the ship you may be able to watch movies, concerts, news and sporting events. While on a Carnival Freedom cruise you'll have the opportunity to enjoy this three-deck high waterslide, offering a fun time for guests of all ages! 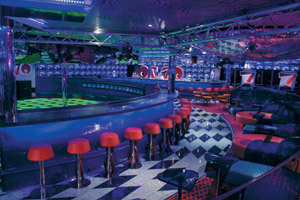 If you're feeling lucky while on a Carnival Freedom cruise, consider spending some time at the ship's large casino. Among the popular games available at this venue are blackjack, poker, roulette, craps and many slot machines. 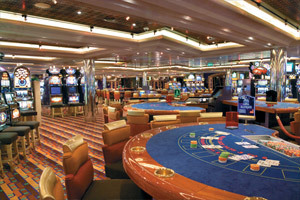 During a typical cruise, there are even gaming tournaments that take place (such as Texas Hold'em). This is a adults-only retreat on board Carnival Freedom, great for those that would like some quiet and relaxing time to enjoy a hot tub, some sun, or even some shade under a large umbrella. Low Price Guarantee on all Carnival Freedom Cruises! Book any Carnival Freedom cruise with us and you'll get the best deal possible, regardless of the ship or sail date! 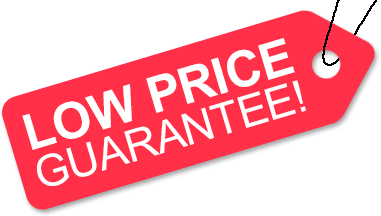 Because of our "Low Price Guarantee," nobody beats our Carnival Freedom cruise prices, so look around and you're sure to find the best Carnival Freedom cruise deal possible when booking with us! Pre-Paid Gratuities on Carnival Freedom Cruises! Get Cruise Cash when you book a Carnival Freedom cruise with us. The value of the Cruise Cash depends on the particular cruise and accommodations you book. Cruise Cash values are listed on Step 3 of the online booking process. Save up to 20% on Carnival Freedom Cruises! Book a 3- to 5-night Carnival Freedom cruise at least 3-months in advance, or a 6-night or longer Carnival Freedom cruise at least 5 months in advance and save up to 20%! Plus, get Price Protection from Carnival: If you find a lower Carnival Advertised Rate, after booking, Carnival will honor it and issue the difference in the form of a non-refundable onboard credit. We do not charge booking fees on any cruises! You're sure to enjoy an affordable Carnival Freedom cruise when booking with us! Our special offers on Carnival Freedom cruises may not be combinable. Certain restrictions apply to each offer. View terms and conditions during the online booking process. 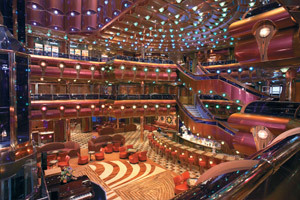 Click a price below to view the Carnival Freedom cruises during that month in that destination. *Category 8F has a 195 square foot room, with a 35 square foot balcony. Has a picture window with an obstructed view, twin beds that convert to a king, as well as individual climate control, TV with first-run movies, phone, lots of drawer and closet space, wall safe, and a private bathroom with shower and hairdryer. Staterooms are available that are modified for wheelchair users.